For other people named John Fogerty, see John Fogerty (disambiguation). 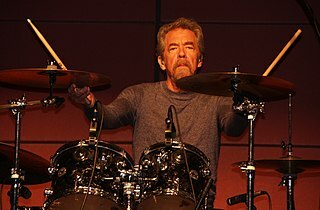 Douglas Raymond "Cosmo" Clifford is an American drummer, best known as a founding member of Creedence Clearwater Revival. After the group dissolved in the early 1970s, Douglas Clifford released a solo album and later joined CCR bassist Stu Cook in the Don Harrison Band. 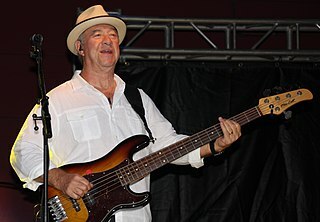 In 1995, Douglas Clifford and Stu Cook formed the band Creedence Clearwater Revisited, performing live versions of Creedence Clearwater Revival songs. After CCR parted ways in 1972, Fogerty had a successful solo career. He was listed on Rolling Stone magazine's list of 100 Greatest Guitarists (at number 40) and the list of 100 Greatest Singers (at number 72). His songs include "Proud Mary", "Down on the Corner", "Centerfield", "Bad Moon Rising", "Green River", and "Fortunate Son". 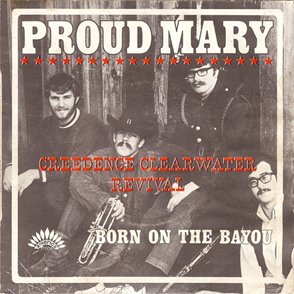 "Proud Mary" is a rock n' roll song written by John Fogerty and first recorded by his band Creedence Clearwater Revival. The song was released by Fantasy Records as a single from the band's second studio album, Bayou Country, which was released by the same record company in January 1969. The single is generally considered to have been released in early January 1969, although at least one source states that it came out just before Christmas 1968. The song became a major hit in the United States, peaking at #2 on the Billboard Hot 100 in March 1969, the first of five non-consecutive singles to peak at #2 for the group. "Down on the Corner" is a song by the American band Creedence Clearwater Revival. It appeared on their fourth studio album, Willy and the Poor Boys (1969). The song peaked at #3 on the Billboard Hot 100 on 20 December 1969. The flip, "Fortunate Son", reached #14 on the United States charts on 22 November 1969, the week before Billboard changed its methodology on double-sided hits. 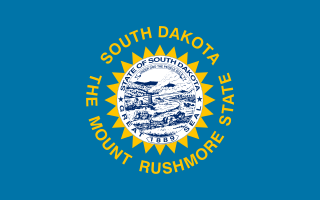 South Dakota is a U.S. state in the Midwestern region of the United States. It is named after the Lakota and Dakota Sioux Native American tribes, who compose a large portion of the population and historically dominated the territory. South Dakota is the seventeenth largest by area, but the fifth smallest by population and the 5th least densely populated of the 50 United States. As the southern part of the former Dakota Territory, South Dakota became a state on November 2, 1889, simultaneously with North Dakota. Pierre is the state capital and Sioux Falls, with a population of about 187,200, is South Dakota's largest city. Saint Mary's College High School came into being as part of Saint Mary's College of California, founded in 1863 by the Catholic Church, and put under the auspices of the Institute of the Brothers of the Christian Schools in 1868. Saint Mary's is a coeducational Catholic school located in Albany, California, although its postal address is in Berkeley, California. El Cerrito High School is a four-year public high school in the West Contra Costa Unified School District. 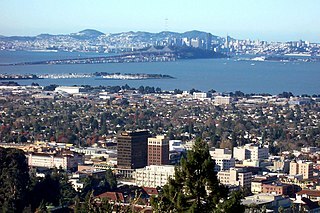 It is located on Ashbury Avenue in El Cerrito, California, United States. Creedence Clearwater Revival was an American rock band active in the late 1960s and early 1970s which consisted of lead vocalist, lead guitarist, and primary songwriter John Fogerty; his brother rhythm guitarist Tom Fogerty; bassist Stu Cook; and drummer Doug Clifford. These members had played together since 1959, first as The Blue Velvets and later as The Golliwogs. Their musical style encompassed roots rock, swamp rock, and blues rock. They played in a Southern rock style, despite their San Francisco Bay Area origin, with lyrics about bayous, catfish, the Mississippi River, and other popular elements of Southern United States iconography, as well as political and socially conscious lyrics about topics including the Vietnam War. The band performed at the 1969 Woodstock Festival in Upstate New York. Richard Wayne Penniman, known as Little Richard, is an American recording artist, musician, singer, songwriter and actor. Fogerty received his draft notice for military service during the Vietnam War in 1966, but that same day, he went to a local United States Army Reserve recruiter, who signed him up immediately. Fogerty was grateful and believed the recruiter dated the paperwork to take effect before the draft letter arrived. During his time in the Army, Fogerty served at Fort Bragg, Fort Knox and Fort Lee. Fort Bragg, North Carolina is a military installation of the United States Army in North Carolina, and, by population, is the largest military installation in the world with more than 50,000 active duty personnel. The installation is located within Cumberland, Hoke, Harnett, and Moore counties. The installation borders the towns of Fayetteville, Spring Lake, and Southern Pines. It was also a census-designated place in the 2000 census, during which a residential population of 29,183 was identified. It is named for Confederate General Braxton Bragg. It covers over 251 square miles (650 km2). It is the home of the Army's XVIII Airborne Corps and is the headquarters of the United States Army Special Operations Command, which oversees the U.S. Army 1st Special Forces Command (Airborne) and 75th Ranger Regiment. It is also home to the U.S. Army Forces Command, U.S. Army Reserve Command, and Womack Army Medical Center. Fort Bragg maintains two airfields: Pope Field, where the United States Air Force stations global airlift and special operations assets as well as the Air Force Combat Control School, and Simmons Army Airfield, where Army aviation units support the needs of airborne and special operations forces on post. Fogerty was discharged from the Army in July 1967. 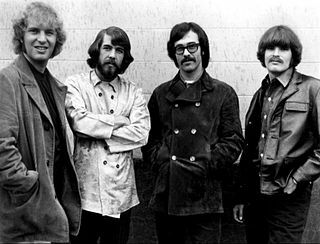 In the same year, the band changed its name to Creedence Clearwater Revival. At this time, he took his brother's place as lead singer for the band. By 1968, things started to pick up for the band. The band released their eponymous debut album and also had their first hit single, "Susie Q". Many other hit singles and albums followed, beginning with "Proud Mary" and the album Bayou Country . Fogerty, as writer of the songs for the band (as well as lead singer and lead guitarist), felt that his musical opinions should count for more than those of the others, leading to resentments within the band. These internal rifts, and Tom's feeling that he was being taken for granted, caused Tom to leave the group in January 1971. The two other group members, bassist Stu Cook and drummer Doug Clifford, wanted a greater role in the band's future. Fogerty, in an attempt to keep things together, insisted Cook and Clifford share equal songwriting and vocal time on what became the band's final album, Mardi Gras , released in April 1972, which included the band's last two singles, the 1971 hit "Sweet Hitch-Hiker", and "Someday Never Comes", which barely made it into the Billboard Top 20. Cook and Clifford told Fogerty that the fans would not accept Mardi Gras as a CCR LP, but he said, "My voice is a unique instrument, and I will not lend it to your songs." He gave them an ultimatum: either they would do it or he would quit immediately. They accepted his ultimatum, but the album received poor reviews. It was a commercial success, however, peaking at number 12 and achieving gold-record status. It generated weaker sales than their previous albums. The group disbanded shortly afterwards. The only reunion of all four original members was at Tom Fogerty's wedding in 1980. Fogerty, Clifford, and Cook played a 45-minute set at their 20th class reunion in 1983, and Fogerty and Clifford were reunited again for a brief set at their 25th class reunion. As CCR was coming to an end, Fogerty began working on a solo album of country & western covers, on which he produced, arranged, and played all of the instruments. Despite the solo nature of the recordings, however, Fogerty elected to credit the album to The Blue Ridge Rangers—a band of which he was the only member. The eponymous The Blue Ridge Rangers was released in 1973; it spun off the top 20 hit "Jambalaya", as well as a lesser hit in "Heart Of Stone". Fogerty, still using "The Blue Ridge Rangers" name, then released a self-penned rock and roll single": "You Don't Owe Me" b/w "Back in the Hills" (Fantasy F-710). It was a commercial flop, failing to make the Hot 100 in the U.S. Fogerty thereafter abandoned the "Blue Ridge Rangers" identity, and released all his subsequent work under his own name. In early 1974, Fogerty released "Comin' Down The Road"—backed with the instrumental "Ricochet". His first official solo album, John Fogerty , was released in 1975. Sales were slim and legal problems delayed a followup, though it yielded "Rockin' All Over the World", a number-27 hit for Fogerty in the United States. In 1977, British boogie rockers Status Quo recorded their version of "Rockin' All Over the World", which became a huge hit and made the song world-famous. Status Quo played it at the opening of the 1985 Live Aid concert. After a hiatus of several years from the music industry, Fogerty's solo career re-emerged with 1985's Centerfield , his first album for Warner Bros. Records, which had taken co-ownership of Asylum's contract with Fogerty. Centerfield went to the top of the charts and included a top-10 hit in "The Old Man Down the Road." The title track is frequently played on classic rock radio and at baseball games to this day, but the album led to legal problems for Fogerty. Two songs on the album, "Zanz Kant Danz" and "Mr. Greed," were believed to be attacks on Fogerty's former boss at Fantasy Records, Saul Zaentz. "Zanz Kant Danz" was about a pig that cannot dance, but would "steal your money." When Zaentz responded with a lawsuit, Fogerty issued a revised version: "Vanz Kant Danz" (changing the lead character's name to Vanz). 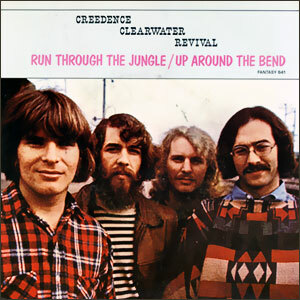 Another lawsuit (Fantasy, Inc. v. Fogerty) claimed that "The Old Man Down The Road" shared the same chorus as "Run Through the Jungle", a song from Fogerty's days with CCR to which Fantasy Records still owned the publishing rights. Fogerty ultimately won his case when he proved that the two songs were distinct compositions. Fogerty then countersued for attorney fees ( Fogerty v. Fantasy ). After losing in the Ninth Circuit Court of Appeals, Fogerty won his case in the U.S. Supreme Court, which ruled that a trial court has discretion in awarding fees to defendants or plaintiffs. On May 31, 1985, Fogerty filmed a one-hour music and interview special for Showtime called John Fogerty's All-Stars. The set list consisted of rhythm and blues tunes from the 1960s, as well as material from the Centerfield LP and the song "No Love in You" written by Michael Anderson, which Fogerty found on the Textones' debut album Midnight Mission and he later recorded with Textones band leader Carla Olson. John Fogerty's All-Stars was recorded in front of an audience of Warners Bros. Music employees and other invited guests at A&M Record on La Brea in Hollywood. The band included Albert Lee, Booker T. Jones, Duck Dunn, Steve Douglas, and Prairie Prince. The follow-up album to Centerfield was Eye of the Zombie in 1986, but it was significantly less successful than its predecessor. Fogerty toured behind the album, but he refused to play any CCR material. Eye of the Zombie took on a darker mood, talking about a troubled society, terrorism, and pop stars selling out. For over 20 years after the Eye of the Zombie tour ended in late 1986, Fogerty refused to play material from the album in concert. However, "Change in the Weather" was included in the set list for his 2009 tour, and it was even re-recorded for that year's solo release, The Blue Ridge Rangers Rides Again . Fogerty returned to the commercial music industry in 1997 with Blue Moon Swamp . The layoff between Zombie and Swamp had been longer than his mid-1970s to mid-1980s break. The album was much more successful than Zombie and won the Grammy for best rock album in 1997. A live album, named Premonition , of the equally successful Blue Moon Swamp tour was released to similar acclaim and good sales in 1998. A track from Blue Moon Swamp titled "Blue Moon Nights," was used in the 2002 film The Rookie . In 2004, Fogerty released Deja Vu All Over Again through DreamWorks Records, which had taken over distribution of Fogerty's Warner catalog. 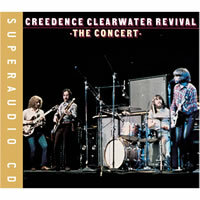 Rolling Stone wrote: "The title track is Fogerty's indictment of the Iraq War as another Vietnam, a senseless squandering of American lives and power". On the album, Fogerty squeezed 10 songs into only 34 minutes. The sale of Fantasy Records to Concord Records in 2004 ended the 30-year estrangement between Fogerty and his former label, as the new owners took steps to restore royalty rights Fogerty had given up to be released from his contract with Fantasy in the mid-1970s. In September 2005, Fogerty returned to Fantasy Records, made possible when DreamWorks Records' noncountry-music unit was absorbed by Geffen Records, which dropped Fogerty, but continued to distribute his earlier solo albums. The first album released under the new Fantasy contract was The Long Road Home (November 2005), a compilation CD combining his CCR hits with solo material. A live CD and concert DVD were released the following year. Fogerty was inducted into the Songwriters Hall of Fame in 2005. On February 10, 2008, Fogerty appeared with Jerry Lee Lewis and Little Richard on the Grammy Awards show. Along with these rock icons and his regular touring band, he played his 1973 single "Comin' Down The Road", leading into Lewis and Richard's performances of "Great Balls of Fire" and "Good Golly Miss Molly", respectively. On June 24, 2008, Fogerty made a return to the Royal Albert Hall, a venue he last played with CCR in 1971. It was the last concert on his 2008 European tour. This concert was filmed (causing staging problems that annoyed some fans)    and was released in 2009. On November 3, 2009, Fogerty released the Royal Albert Hall DVD entitled Comin' Down The Road , named after his 1973 single, which he performed at this concert. Fogerty was also nominated for a Grammy Award at the 2010 Grammys. He was nominated for the Best Rock Solo Vocal Performance Grammy for the song "Change in the Weather", which he recorded for The Blue Ridge Rangers Rides Again . Fogerty began recording Wrote a Song for Everyone in 2011, which was released on Vanguard Records on May 28, 2013, his 68th birthday. The album is a collection of classics and tracks from his canon of hits performed with other artists. The album includes two new Fogerty-penned songs. On November 17, 2011 Fogerty performed on the Late Show with David Letterman . On November 17 and 18, Fogerty performed two CCR albums, Cosmo's Factory and Green River , respectively, in their entirety at the Beacon Theater in New York City (he also played Cosmo's Factory in Atlantic City on November 20). He was also featured on the CBS coverage of the Thanksgiving Day Parade, performing several prerecorded songs. ↑ The Concert at Walter Reed. pp. 7–. ISBN 978-1-4343-4646-9. ↑ Bill Shapiro (1 January 1988). The CD Rock & Roll Library: 30 Years of Rock & Roll on Compact Disc. Andrews and McMeel. p. 47. ISBN 978-0-8362-7947-4. ↑ Dafydd Rees; Luke Crampton (1991). Rock Movers & Shakers. ABC-CLIO. p. 99. ISBN 978-0-87436-661-7. ↑ Ruhlmann, William. "Artists/John Fogerty/Biography". billboard.com. Billboard. Retrieved July 24, 2017. ↑ "Billboard 200". billboard.com. March 23, 1985. Retrieved 2009-08-18. ↑ "100 Greatest Singers of All Time/John Fogerty". rollingstone.com. Rolling Stone. December 2, 2010. Retrieved July 24, 2017. 1 2 3 4 Fogerty, John (October 2015). Fortunate Son- My Life, My Music. New York: Little, Brown and Company. pp. 9–25. ISBN 978-0-316-24457-2 . Retrieved July 22, 2017. ↑ Hurd Anyaso, Hilary (May 2011). "Founder of Berkeley Folk Festival to Visit Northwestern" . Retrieved February 3, 2017. ↑ Thompson, Art. 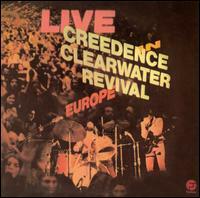 "John Fogerty Summons His Creedence-Era Spirit on Revival"
↑ Greene, Andy. Q&A: John Fogerty on All-Star Duets LP, Unlikely Creedence Reunion, Rolling Stone , May 4, 2012. ↑ "John Fogerty". Psych.mcgill.ca. Archived from the original on July 15, 2009. Retrieved 2009-08-10. 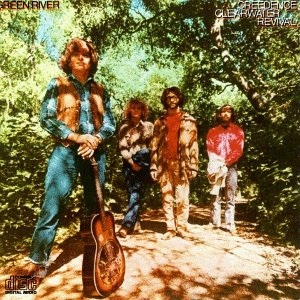 ↑ "Creedence Clearwater Revival". rockhall.com. Rock and Roll Hall of Fame. 1993. Retrieved July 24, 2017. ↑ "Blue Moon Rising: The John Fogerty Interview (Cover Story)". Audio Magazine. January 1998. ↑ "John Fogerty – In Concert Against AIDS". thejakubowskis.com. 2004. Retrieved June 1, 2010. ↑ Gilbert, Calvin (December 13, 2005). "John Fogerty Embraces His Past". CMT News. Retrieved 2008-06-10. ↑ Spevak, Jeff (July 31, 2008). "John Fogerty's epiphany at a bluesman's plot". Democrat and Chronicle . Retrieved 2008-08-02. ↑ Yellin, Emily (September 30, 1997). "Homage at Last for Blues Makers; Through a Fan's Crusade, Unmarked Graves Get Memorials". The New York Times . Retrieved 2008-06-10. ↑ Sweeting, Adam (July 11, 2000). "The saddest story in rock". theguardian.com. Retrieved March 30, 2015. ↑ Barker, Derek (2009). Liner notes to Bruce Springsteen's Jukebox: The Songs that Inspired the Man [CD]. Chrome Dreams. ↑ "Recent Hollywood Events". Seeing-stars.com. Retrieved 2010-03-30. ↑ "''NFL.com'', 20 November 2006". Nfl.com. November 23, 2009. Retrieved 2010-03-30. ↑ "Website for the Kansas City/Denver Thanksgiving game halftime promoters". Pregamehalftime.com. September 13, 2009. Retrieved 2010-03-30. ↑ Thanksgiving game – Volunteers needed! Archived September 30, 2007, at the Wayback Machine KCChiefs.com, November 13, 2006. ↑ "John Fogerty debuts at Glastonbury Festival in 2007 - Electric Bayou - Creedence Clearwater Revival & John Fogerty". ↑ "John Fogerty triumphs at Glastonbury". Uncut. June 24, 2007. ↑ "Concord Group: ''Revival'' Album". Concordmusicgroup.com. October 2, 2007. Archived from the original on April 30, 2009. Retrieved March 30, 2010. ↑ Cole, Paul (July 4, 2008). "John Fogerty@Royal Albert Hall, London". Sunday Mercury . Retrieved 2008-07-22. ↑ Belam, Martin (June 30, 2008). "Being an extra on John Fogerty's Live at the Albert Hall DVD". currybet.net. Retrieved 2008-07-07. ↑ "John Fogerty at the Albert Hall". The Word. June 28, 2008. Archived from the original on December 20, 2008. Retrieved July 24, 2008. ↑ "Full audio of John Fogerty singing "Centerfield" at regular season opening day at the new Yankee Stadium in the Bronx on Thursday, April 17, 2009". Archived from the original on April 18, 2009. ↑ Graff, Garry (December 10, 2008). "Fogerty Revisits 'Blue Ridge' On New Album". Billboard . Retrieved 2008-10-03. ↑ "Universal Music Group". New.umusic.com. January 25, 2006. Retrieved 2010-03-30. ↑ "Twenty-five years later, it's still only rock 'n' roll to HBO". TwinCities.com. Retrieved 2011-10-02. ↑ "Rock & Roll Hall of Fame hosted 2 very long shows @ MSG (setlists), will air on HBO Thanksgiving weekend". Brooklynvegan.com. November 2, 2009. Retrieved 2011-10-02. ↑ "John Fogerty Named BMI Icon at 58th Annual BMI Pop Music Awards". bmi.com. Retrieved 2010-10-06. ↑ "Legendary John Fogerty to Release New Album". JohnFogerty.com. Archived from the original on April 10, 2012. Retrieved April 3, 2012. ↑ "Late Show with David Letterman Guests". CBS.com. Retrieved 2014-05-23. ↑ "John Fogerty To Publish His Memoirs". JohnFogerty.com. Archived from the original on December 27, 2012. Retrieved November 12, 2012. ↑ "John Fogerty Signs With BMG For New Album, Solo Reissues: Exclusive". ↑ Cramer, Alfred W. (2009). Musicians and Composers of the 20th Century, Vol. 2. Salem Press. p. 456. ISBN 1587655128. ↑ "Rocker John Fogerty May Call South Bend Home". Chicago Tribune . Associated Press. May 31, 1997. Retrieved June 27, 2013. ↑ "John Fogerty is Married". The Mount Airy News . Associated Press. April 22, 1991. Retrieved May 29, 2013. ↑ Gundersen, Edna (October 2, 2007). "John Fogerty revels in new 'Revival' album, tour". USA Today . Retrieved May 29, 2013. ↑ Lewis, Randy (November 21, 2009). "Rock and country have a strong claim on Fogerty". The Los Angeles Times . Archived from the original on November 24, 2009. Retrieved May 29, 2013. Centerfield is the third solo studio album by musician John Fogerty. Released in 1985, it spawned the hit singles "The Old Man Down the Road", "Rock and Roll Girls" and the title track "Centerfield". This was Fogerty's first album in nine years; After Asylum Records rejected his Hoodoo album, he decided to take a long break from the music business because of legal battles with his record company. In the meantime, Fogerty's recording contract with Asylum Records was reassigned to co-owned Warner Bros. Records so this album was the first released on the Warner Bros. label. The Long Road Home: The Ultimate John Fogerty/Creedence Collection is a compilation album by American roots rock singer-songwriter John Fogerty, released on November 1, 2005, by Fantasy Records. It compiles songs from Fogerty's solo career and his band Creedence Clearwater Revival. The title refers to Fogerty's return to Fantasy Records, after a lengthy stint with Warner Bros. Records and a brief stint with DreamWorks Records. 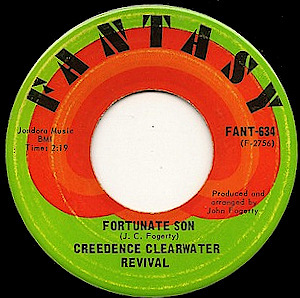 "Fortunate Son" is a song by the American rock band Creedence Clearwater Revival released on their fourth studio album, Willy and the Poor Boys in November 1969. It was previously released as a single, together with "Down on the Corner", in September 1969. It soon became an anti-war movement anthem; an expressive symbol of the counterculture's opposition to U.S. military involvement in the Vietnam War and solidarity with the soldiers fighting it. The Blue Ridge Rangers is the first solo studio album by John Fogerty, the former lead singer and lead guitarist of Creedence Clearwater Revival. "Who'll Stop the Rain" is a song written by John Fogerty and originally recorded by Creedence Clearwater Revival for their 1970 album Cosmo's Factory. Backed with "Travelin' Band", it was one of three double-sided singles from that album to reach the top five on the Billboard Pop Singles chart and the first of two to reach the #2 spot on the American charts, alongside "Lookin' Out My Back Door". In 2004, Rolling Stone ranked it #188 on its "500 Greatest Songs of All Time" list. John Fogerty is an American musician who has recorded both solo and as a member of Creedence Clearwater Revival. Bordowitz, Hank (2007). 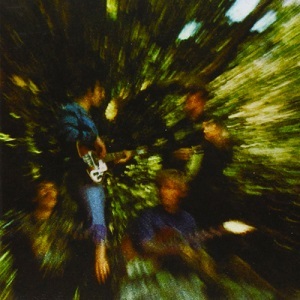 Bad Moon Rising: The Unauthorized History of Creedence Clearwater Revival. Chicago Review Press. ISBN 978-1556526619. Wikimedia Commons has media related to John Fogerty .